As part of Samsung’s throw-everything-at-the-wall-and-see-what-sticks strategy, the Galaxy Note 8.0 looks like a winner. It’s a nice manageable size; the Super AMOLED screen looks great; it’s got plenty of power under the hood; and the built-in S-Pen stylus is very handy. You can find our full verdict in our Samsung Galaxy Note 8.0 review. If that’s enough to tempt you into buying one, or if you’ve already snapped one up, then you’ll be on the hunt for shortcuts and tricks to enhance your user experience. Without further ado here are our Samsung Galaxy Note 8.0 tips for your edification. There are three ways to take a screenshot on a Samsung Galaxy Note 8.0. Whatever method you choose, the screenshot will appear in your Notifications, and also in a Screenshots folder in the Gallery. Hold down the Power key and the Home key simultaneously until you hear the shutter sound. Go into Settings > Motion and tick the box next to Palm swipe to capture. Now you can simply swipe your palm across the screen to capture a screenshot. Your final option with the Note 8.0 is the best and it uses the S-Pen. You can take a screenshot by pressing and holding the S-Pen button and then touching the screen until you hear the shutter sound. If you want to annotate the screenshot before saving, then tap and hold the S-Pen on the screen with the button depressed. You can also press and hold the button, and then circle an area of the screen to capture a specific section. If you want to annotate or edit your screen capture, you can choose an app from the pop-up menu and drop it straight in there. If you want to take full advantage of the S-Pen and create shortcuts to specific functions then you need to get to grips with the Quick Command feature. Hold down the S-Pen button and draw a straight line upward on the Note 8.0 screen and you’ll get the Quick Command pop-up. You can now draw a symbol to launch an app. For example, draw the @ sign and you’ll launch email. You can set up your own quick commands via Settings > Quick Command settings > Add a command. 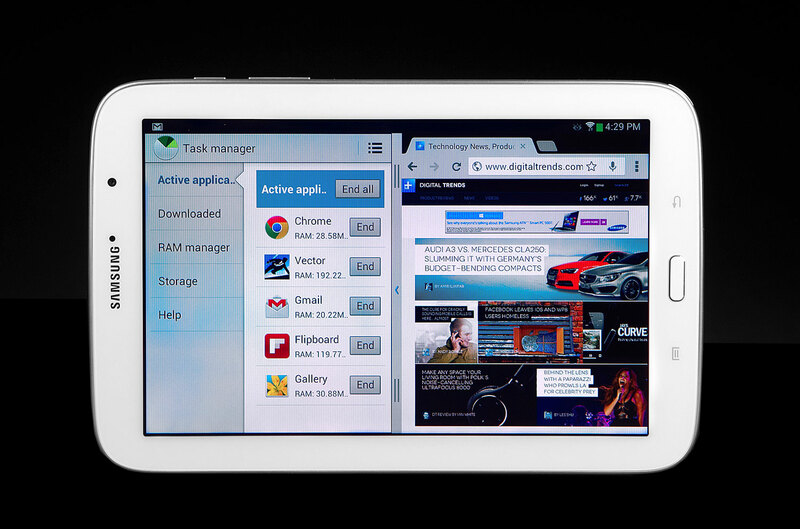 Samsung offers a multi-tasking slide out menu on many of its devices. You simply hold the Back button down until you see a tab pop-up on the left hand side of your screen (tap and hold on it in order to move the tab elsewhere). Tap on the tab and a tray of apps slides out. You can edit what appears in it and use it as a quick access point for your favorite apps. It has never seemed like a very useful feature, but on the Note 8.0 it is rendered awesome by the addition of a feature called Dual Screen View. You can have two apps on the screen at once, so you could watch a video and write in a document at the same time. To use it, open the tray and select the first app that you want, and it will open full screen. Now, drag the second app you want from the tray onto the screen and you should get a split screen view with both of them. You can also resize the screens using the standard pinch gesture. This multi-window functionality is extended to pop-up browser and pop-up video functions which allow you to click on links and open a browser window or play a video without closing or leaving the app you are in. Being able to get a sneak peek at the content of an email, a folder, or even a news story without having to fully launch it can be very handy. Samsung calls this Air View, but it is essentially a hovering preview function, or a sneak peek. All you have to do is hover your S-Pen over an email, a folder, a gallery, or a news story in the Flipboard app, without touching the screen, and you’ll see a preview of what’s inside. This preview function also works for tool tip pop-ups if you hover over certain menu options in apps such as Samsung’s S Note. 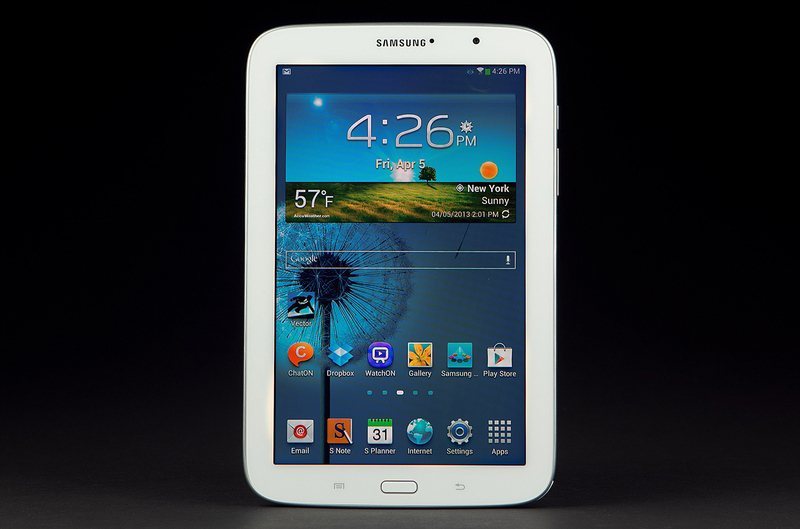 The Note 8.0 is a good size for reading and you’ll want to browse the Web on it and maybe read magazines or books. If you activate Reading mode then the screen brightness tone down so that’s it’s easier on the eyes, and the background will look more like paper. The Smart Stay feature will also automatically turn on, which prevents the screen from sleeping while you are looking at it. Just drag down the notification bar and tap Reading mode to turn it on or off. It’s also worth mentioning that if you use Samsung’s Readers Hub app, you’ll enjoy page turn animations and the ability to highlight text and annotate books using your S-Pen. You’ve got a choice when it comes to employing your Note 8.0 as a universal remote control and TV guide. You can either use Samsung’s Watch ON app or you can use the pre-installed Peel Smart Remote app. The tablet features an IR blaster, so it can control a wide variety of devices. The Peel app is best employed as your remote, because it’s very intuitive and easy to set up. You’ll need to make sure that Power saving mode is turned off on the Note 8.0 for it to work properly. You’ll also get a TV schedule on this app and all the basic controls that you need. Watch ON is more focused on selling you content, but it does have a handy search function and it can pull in results from on demand services, which is handy when you want to find a specific movie or show. Search for what you want and you’ll get info, with IMDB and Rotten Tomatoes links, as well as an option to watch, which lists where you can buy, rent, or stream it from. If you want to be able to get your bookmarks, and even see the open tabs from your computer or laptop, on your Note 8.0 as well, then you should download the Chrome browser. Assuming you have a Google account, and that you use Chrome elsewhere, you can install the app on your Note 8.0, sign in to your Google account, and your bookmarks will be shared automatically. Anyone with a video collection on their PC or laptop, looking to load videos onto their Note 8.0 and watch them there should download two free, handy apps. First of all, you want ES File Explorer File Manager, so that you can easily find and manage your files. Secondly, you should download MX Player, as it can handle just about every video format under the sun. It offers support for subtitles and a really handy kid’s lock option, too. There are plenty of cloud storage services now, including SkyDrive, Box, Google Drive, and Dropbox. They all offer Android apps and some free space, so you can quickly and easily transfer files wirelessly. We recommend Dropbox, and if you find that the app is pre-installed on your new Galaxy Note 8.0, and you carrier is participating in the promotion, then you could get 48GB of space for free, for two years. You can check this page at Dropbox to find out for sure. That’s it for Galaxy Note 8.0 tips for now, but if you have a suggestion that you’d like to share then please post a comment. Make sure to check back, as we will periodically update this roundup with new tips.